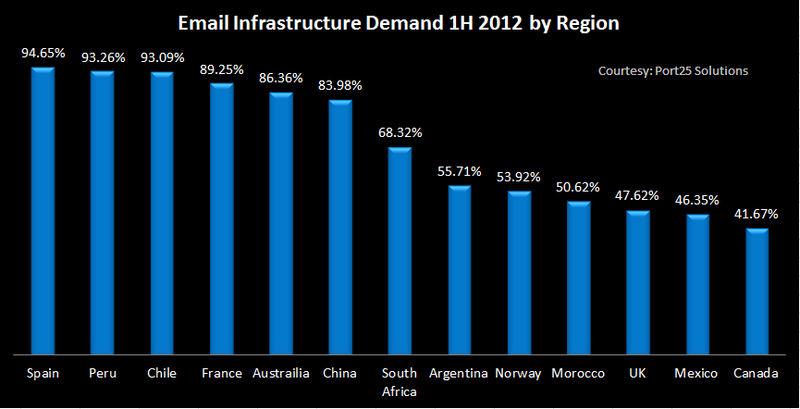 Email Infrastructure demand by Region. | Port25 Solutions, Inc.
Blog Email Infrastructure demand by Region. In the second quarter of 2012, demand for carrier grade Email Infrastructure continues to be robust both inside and outside of the United States. ESPs and enterprise level agencies can capitalize on this data and may consider it as a leading indicator by targeting these regions and offering complimentary or ancillary services and gain further traction related to digital messaging. Below is a chart that shows quarter over quarter growth in the first half of 2012. In our ecosystem at Port25, we’re seeing demand in increasingly more remote countries such as Morocco, The United Arab Emirates and Chile.